Amid Backlash Against Isolating Inmates, New Mexico Moves Toward Change The heavy reliance on solitary confinement in New Mexico went unquestioned for decades. Now, the state is gradually shifting away from the practice, though it probably won't ever fade from the system. 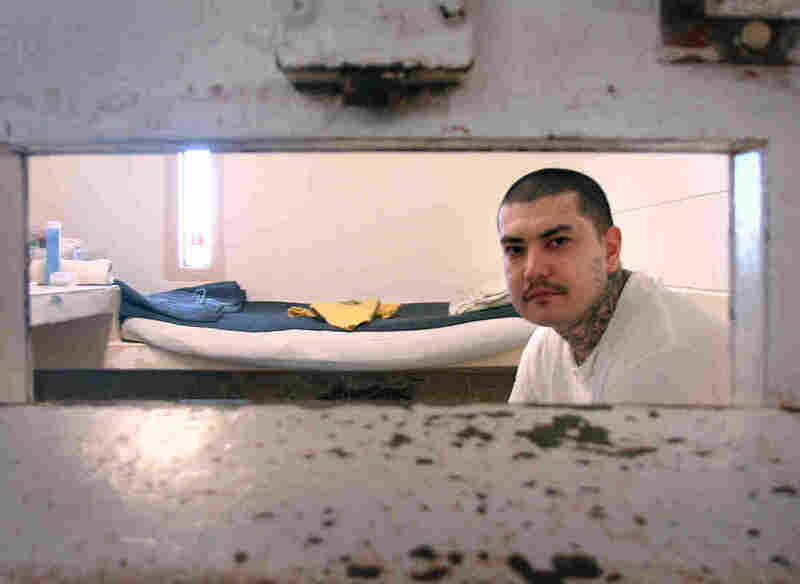 Nicklas Trujeque in his solitary confinement cell in New Mexico State Penitentiary. Inmates spend 23 hours a day in these cells, with a one-hour period in an open cell outside. According to the New Mexico ACLU, until recent state reforms, the average length of stay for an inmate here was around three years. Second in a three-part report on solitary confinement in U.S. prisons. Level 6 of New Mexico's state penitentiary in Santa Fe is a dense complex of prison cells, stacked tight. As the gate opens, men's faces press against narrow glass windows. They spend 23 hours a day in solitary. Security is so high that talking to one of the inmates, Nicklas Trujeque, requires a guard passing a microphone through the food port of his cell door. Trujeque has a round, pock-marked face, dark eyebrows and a thin mustache. Tattoos climb his neck to his ears. He's 29. He's been in and out of jail since he was 11, often for violent crimes. He describes the tiny cell that makes up his world this way: "You ever seen, like, I remember my grandpa had a shed in his back yard that he kept his tools in. I mean, to be honest, I wouldn't wish this on anybody. It's hard time." Trujeque is in solitary because he stabbed a parole officer and then assaulted a prison guard. He's been in this cell for the past year and two months and has another month to go. The one hour Trujeque gets outside he spends in a cage the size of this cell. Trujeque says every hour he spends in here, he's focused on not losing his mind. "Basically what it is, it's mental warfare. Like, I'm telling you right now, this place'll either change you or make you worse. You know what I'm saying?" he says. "If you're not strong enough mentally? It'll crush you." Solitary confinement has been the go-to method for handling discipline and security in American prisons since the mid-1980s. High-risk inmates like Trujeque wind up here, but studies show that a lot of inmates are sent to solitary for minor infractions. According to an estimate by the Vera Institute of Justice, as many as 80,000 people are held in isolation cells right now across the U.S. Solitary is so widespread, so common, that a lot of states don't even track how many people are in isolation or for how long. But a growing number of lawmakers, judges and activists are convinced that this policy is immoral and violates basic human rights. "We had a case come before our court a few weeks ago," Supreme Court Justice Anthony Kennedy told a Capitol Hill hearing this spring. "The prisoner had been in an isolation cell, according to the attorney — I haven't checked it out — for 25 years. Solitary confinement literally drives men mad." Kalief Browder, who was held in solitary confinement and faced brutal attacks by guards at Rikers Island for two years without a conviction, ended his life in his home earlier this summer. In New Mexico, many low-risk inmates were moved out of solitary. The men still housed in isolation can now earn their way out in nine months with good behavior. That's still more time in solitary than most reform advocates and most mental health experts support, but not so long ago, New Mexico's solitary unit was packed with inmates who were thrown into cells "and then we really had no clear-cut way to get them out of there," says Gregg Marcantel, head of New Mexico's prison system. He says when he came in as corrections secretary four years ago, that heavy reliance on solitary had been unquestioned for decades. [I]n a perfect world, one that maybe involves unicorns, yeah, I would love to get rid of it. "It's very, very easy to overuse segregation. I mean, for a guy like me it's safe, right? It's safe — if these prisons are quiet, I don't get fired," he says. One of Marcantel's new programs gives prisoners the chance to live in a more open group setting if they swear off their gang affiliations. For corrections leaders like Marcantel trying to change the system, it's a struggle to get it right. None of his reforms get rid of solitary. He says he can't see it ever going away. "But i­n a perfect world, one that maybe involves unicorns, yeah, I would love to get rid of it," he says. So far, New Mexico's first steps toward change seem to be working. Two years ago, 10 percent of the state's prison population was in solitary. That's down to 6 percent this year. 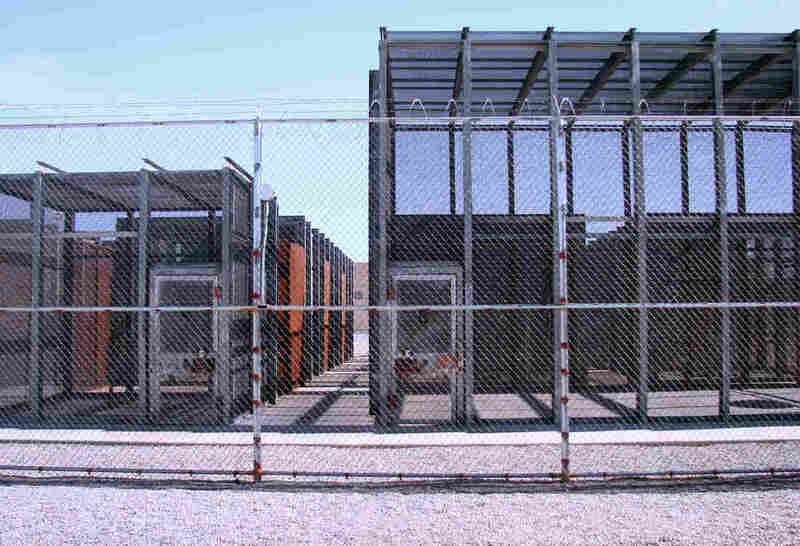 Inmates in solitary confinement in the New Mexico state penitentiary are allowed one hour a day outside, in these individual cages. Each inmate has to strip all the way down in a cage inside before and after his hour of recreation. But experiments like this one have proved fragile around the U.S., sometimes unraveling or getting rolled back. The only way Marcantel's changes will last is if front-line corrections officers buy in. Guys like Sgt. Juan Sena, who has worked in the solitary confinement unit here for more than a decade, are torn. "It's just, it's gonna be more dangerous," he says. Sena admits he's nervous about the changes that are coming, what it will mean for inmates — who have only known the walls of a cell for years — to be back among the general population. "It's going to be a lot more dangerous for these guys, 'cause these guys aren't used to coming out, and a little more dangerous for the staff. But it's what we signed up to do, and we're here to do the job," he says. But Sena also says changing the system is probably the right thing to do. Not everybody agrees. Getting corrections officers to let go of a strategy they've been using for decades won't be easy. But according to the ACLU and state officials in New Mexico, there's been no measurable increase in violence since the changes began.